So GM made the mistake of sinking billions into electric cars that aren't selling all that well, and now expects the taxpayer to bail them out (again). As a GM stockholder and taxpayer, I oppose this money grab! GM's revenue increased 6.4 percent to $35.8 billion in the third quarter. The company announced a global profit margin of 8.8 percent, including 10.2 percent in North America. The 2018 results for the third quarter compare to a loss of almost $3 billion a year ago, due to the sale of its Opel/Vauxhall European operations. GM's pretax profit grew by $630 million from a year earlier to $3.2 billion. Before the earnings announcement, GM shares were up 1.2 percent to $33.54 in premarket trading. GM on Tuesday declared a fourth-quarter dividend of 38 cents a common share. DETROIT -- General Motors is offering voluntary buyouts to roughly 18,000 salaried employees in North America who have 12 years or more experience. The company, after inquiries about the offer, confirmed the plans as "proactive" measures to address future headwinds that GM expects as it invests in autonomous and electrified vehicles and as auto sales in North America and China — its largest markets — slow. "We are doing this while our company and economy are strong," the company said in an emailed statement. "The voluntary severance program for eligible salaried employees is one example of our efforts to improve cost efficiency." A notification was sent regarding the voluntary severance program to employees Wednesday morning, as the automaker reported a 25 percent increase in pretax profit in the third quarter and net income of $2.5 billion. If GM determines that there are not enough volunteers for the buyout, the company could terminate employees. GM refused to disclose the number of people it wants to take the buyout offer or the buyout program's expected cost. "We will evaluate the need to implement after we see the results of the voluntary program and other cost reduction efforts," GM said. Eligible employees — roughly 36 percent of its 50,000 North American salaried workforce — have until Nov. 19 to make a decision regarding the program. Buyouts are not uncommon in the auto industry. However, they typically occur when a company is restructuring or going through a decline. They also are typically offered for those close to retirement. The buyout offer comes as Ford Motor Co. is undertaking an $11 billion restructuring that includes reducing its global salaried workforce of 70,000 under CEO Jim Hackett. GM has a global salaried workforce of 77,000 people, according to its 2017 annual filing. That's down from 90,000 a year earlier, before GM sold its European operations to PSA Group. The program is in addition to the company’s previously announced plans to squeeze $6.5 billion in cost efficiencies from 2015 to 2018. GM CFO Dhivya Suryadevara said the company will achieve that goal. GM reached $6.3 billion in cost-saving measures by the end of the third quarter, she said. “We are focused on cost and will continue to do more,” she said Wednesday in response to a question from Automotive News about possibly reducing salaried employees. General Motors Co. is postponing renovations to its famed design studios and halting a project to update its global propulsion headquarters in metro Detroit in an effort to save money. The plans for the projects in Pontiac and Warren, which were expected to cost hundreds of millions of dollars, were detailed in a long letter sent Wednesday to employees by GM CEO Mary Barra, making the case that the Detroit-based automaker needs to curtail costs to protect itself against an unpredictable future. A copy of the letter was obtained by Automotive News. The two projects Barra cited include $180 million for a 360,000-square-foot expansion to its design studios and a new parking structure. Both were supposed to be the "final stage" of a $1 billion transformation of GM's tech center campus in Warren. Renovations at the propulsion center in Pontiac were part of a wider initiative by the automaker to update and transform its older facilities into open office spaces. It's unclear how much of the planned renovations were completed. A GM spokesman said those details weren't immediately available. The letter also detailed plans to offer voluntary buyouts to about 18,000 salaried employees in North America and "most" global executives who have 12 years or more experience, which the automaker confirmed Wednesday. In the letter, Barra details internal and external factors such as trade and global economic conditions that the company cannot control but must be prepared to address. "Today, our structural costs are not aligned with the market realities nor the transformational priorities ahead," she said. "We must take significant actions now to address this while our company and the economy are strong." Scrapping investment in the two projects are examples of ways the company aims to reduce structural costs and increase free cash flow. Barra described free cash flow as being pivotal to the company in the event of a downturn, so that it can continue investments in emerging, yet costly, future technologies such as autonomous and electrified vehicles. Without a strong cash position, she said, the company "cannot be the agile, innovative industry leader" it needs to be to achieve its longer-term objectives. GM expects to have roughly $4 billion in adjusted automotive free cash flow to end the year, up from a loss of $310 million at the end of the third quarter, which Barra cited in her letter. "To achieve what this company is truly capable of — and to win — we need to be even more agile and faster to market," she said. "We need to get ahead of headwinds, rather than let them happen to us." The letter went out to employees soon after GM reported third-quarter earnings that significantly beat Wall Street expectations, including $2.5 billion in net income. In the context of those results, Barra wrote, it may be hard for some to understand the need for cuts, but "profitability is only part of what is required for our transformation." She said that despite solid profits, skepticism of the company remains, noting that GM shares were recently trading below their 2010 initial public offering price of $33 a share. Barra encouraged all eligible employees to "seriously consider" the severance program, while asking everyone to "stay focused on improving the financial performance of the company." DETROIT — Is it the best of times or the worst of times? General Motors is broadcasting a seemingly bipolar message, reporting a $2.5 billion third-quarter profit and a 25 percent rise in pretax earnings last week, and then following up with news of voluntary buyouts, an inkling of layoffs and a warning about the need to control costs before they overwhelm the company. But the underlying message to Wall Street and the rest of the industry is more cohesive: The "new" GM, tempered by a brush with death nearly a decade ago, is determined to keep investing in strategic, but costly, programs such as electrification and autonomous driving technology. And it's determined to ensure it has enough money to sustain those investments during an "eventual downturn" in the economy. "To achieve what this company is truly capable of — and to win — we need to be even more agile and faster to market," GM CEO Mary Barra wrote in an email to employees last week addressing the buyouts and cost cuts. "We need to get ahead of headwinds, rather than let them happen to us." The headwinds, Barra and Wall Street analysts note, already are swirling. GM's global sales are weakening, especially in China and the U.S., the company's remaining strongholds. In her message, obtained by Automotive News, Barra detailed internal and external factors, such as trade policy and global economic conditions, that the company cannot control but must be prepared to address. She said the company needs to increase free cash flow by cutting structural costs and nonessential investments, such as building renovations that were expected to cost hundreds of millions of dollars. The actions and tone were typical of a time of operational and financial chaos for the 110-year-old automaker. This time, though, they are being framed as proactive steps for GM to be able to weather a downturn without shortchanging its future. Barra and her executive team know well how financial strains can threaten forward thinking. One of GM's technological breakthroughs, the Chevrolet Volt plug-in hybrid, emerged in production form amid an internal financial crunch and a global credit crisis that put the project's viability in question ahead of GM's 2009 bankruptcy. "We're working hard to prove every day that we're a different company," Barra said last week during a televised interview. She was comparing present-day GM with its past. But she may as well have been speaking of rival Ford Motor Co., which in October announced the outlines of an $11 billion global restructuring that would include unspecified salaried job cuts, even as it committed $740 million for an office campus in Detroit. Bank of America Merrill Lynch research analyst John Murphy wrote in a research note that Ford is "struggling to perform amid a more challenging operating environment." GM, he said in a separate note, "has already taken material actions to get ahead of the curve and is now well positioned to perform amid the storm that is wreaking havoc for others." Third-quarter results back up Murphy's assessment. While Ford experienced a 37 percent drop in earnings due to poor results in China and other markets, GM significantly outperformed Wall Street's expectations on strong profits in China and North America, despite lower sales. As Ford pushed back its target of 8 percent global profit margins — currently at 4.4 percent — by 2020, GM reported an 8.8 percent margin for the third quarter. GM's cost cutting isn't over. "We're going to have an intense focus on cost, and we'll find more opportunities to take cost out of the system and maintain a low break-even point," CFO Dhivya Suryadevara said last week. She said GM will achieve its previously announced goal of realizing $6.5 billion in cost efficiencies from 2015 to 2018. Additional goals or cost-cutting measures could come when the company announces its guidance for 2019, she said. Those measures could include layoffs of salaried employees if not enough workers take the buyouts. The buyouts will be available to roughly 18,000 salaried employees in North America and "most" global executives who have 12 years or more of experience. They have until Nov. 19 to make a decision. GM's willingness to cut costs at headquarters could help the company make a more convincing case for trimming production capacity when it negotiates new contracts with the UAW next year. GM's capacity utilization rates in the U.S. are the lowest of all automakers. Of its 12 U.S. assembly plants, five are operating on three shifts; three are on two shifts; and four are on a single shift.
" ... there is still much more to do in transforming General Motors into the automotive company of the future. Our industry is subject to significant technological, economic and regulatory disruption." "No matter what challenges we face, we are accountable for how we run our business, both in the day-to-day and in anticipating the road ahead." " ... those outside our company are skeptical of our ability to manage through an eventual downturn in the economy — skepticism we see in our stock price." "I understand that what I shared today may be difficult news to hear. In keeping with our values, the [senior leadership team] and I commit to provide updates as we move forward in a transparent and respectful way." I wasn't sure about her but this is a great strategy. Stay in front of the 8 ball. While Ford is trying to stay afloat she's working on being more efficient. This is why I now own more of GM than Ford, though my dad, a Ford man to the end, is probably turning over in his grave. While Ford is researching electric cars, GM has brought an electric car to market. While Ford expects enthusiasts to beg for the chance to blow $400k on a Ford GT, GM is about to eclipse the Ford GT with an under $100k 'Vette. And in trucks GM has now largely matched Ford's offerings in North America and offers a cabover Ford doesn't to boot. Occupants of the upper floors of "glass house", better get your act together! Answer no! You have to remember-he is a "cerebral thinker". And he earned his stripes as the guy that turned Steelcase around ( on Fortune "1000", no 625 )-to say nothing of a stint as athletic director at Michigan. And let's not forget the 700 million they are going to spend to save the historic railroad station in Detroit. But you can't blame him completely for that one. I'm sure Bill and Edsel Ford pushed for that for the sake of good ol' Detroit-but you can bet Hackett wouldn't have the balls to rock the boat on that one given fact Bill Ford gave him the job. So you have Ford led by a "cerebral thinker" who earned his stripes saving an office furniture company-in an industry where corporate customers abandon leases everyday leaving their office furniture behind- because I guess its cheaper to buy new than move the old stuff- while GM is led by an engineer who has a long track record with the company-and obviously understands why they went bankrupt. I wonder if Hackett has taken the time to understand why Mulally was so successful? DETROIT — A business line General Motors pioneered nearly a century ago is expected to begin significantly contributing to the company's future, providing a fount of profits to fund investments in emerging technologies such as electrified and autonomous vehicles. GM Financial, the company's captive auto financing arm, paid GM a $375 million dividend on Oct. 30 that will be reflected in the GM's fourth-quarter earnings. It's the first in a series of annual payouts GM Financial will pay GM until it consistently holds 50 percent of GM retail sales penetration in the U.S., which is expected to occur in the early 2020s. The dividend, according to GM CFO Dhivya Suryadevara, will strengthen long-term cash generation and free cash flow — targeted to be $4 billion to end 2018. "Combined with the ongoing GM Financial dividend and our focus on cost reduction, we see significant opportunity to improve cash generation," she told analysts when discussing third-quarter earnings on Oct. 31. "We are confident in the opportunity ahead of us and continue to expect strong performance over the short term as well as the long term." GM Financial refers to its leverage ratio — measured as the ratio of net earning assets to tangible net worth — to determine how and when to send capital back to GM. In 2015, announced a target to more than double pretax earnings of $803 million from 2014 to as much as $2 billion for GM Financial by 2018. Through the first nine months of this year, it was at $1.48 billion. Suryadevara said earnings for GM Financial will experience "traditional seasonality" in the fourth quarter, but the business will still report "significant" profit growth for the year compared to 2017.
Financing 50 percent of GM's retail sales in the U.S. has been an important goal in delivering on GM Financial's value propositions, said GM Financial CFO Susan Sheffield. "We talk about loyalty and retention and are a true captive at those levels," she told Automotive News this month. GM has a long, complex and pioneering history with captive financing firms. It established General Motors Acceptance Corp. as the industry's first captive finance company in 1919 — decades ahead of others such as Ford Motor Co. The business helped GM weather difficult times in its core automotive business and later diversified into other financial services, such as insurance and mortgages. However, GM sold its majority stake in the company in 2006 in a scramble to raise cash. It further reduced its stake in 2009, as part of its government bailout and bankruptcy restructuring. The rebranded business became the independent bank Ally Financial, which continued to provide financing to GM dealers and customers. But GM didn't stay out of the financing game for long. In 2010, it formed GM Financial with the acquisition of subprime lender AmeriCredit and has expanded the business by adding services such as prime and floorplan lending and taking or acquiring business from Ally. In 2015, GM notified Ally that it would steer all of its lease subsidies for its brands in the U.S. to GM Financial, instead of distributing them among Ally, GM Financial and, to a lesser extent, U.S. Bank. The move gives GM more control of its customer data and a better shot at keeping its off-lease customers. Ally also sold GM many of its international business operations such as China, Europe, South America and Mexico starting in 2013 — the same year it sold its remaining stake in Ally. Suryadevara said GM expects the financial arm to continue doing well despite challenges such as higher interest rates. "We're, again, continuing to risk-manage this business, and this is going to be a strong contributor to earnings as we move forward," she said. While the unit's financial results have improved — a net income of $441 million in the third quarter vs. $51.3 million eight years ago — GM Financial still has operational and reputation hurdles to clear. It ranked below average on the J.D. Power 2018 U.S. Dealer Financing Satisfaction Study, which followed as many as 2.5 million GM Financial customers affected by problems that followed a systemwide technology upgrade in late December. From January through May, the lender stopped reporting customers' payment information to credit bureaus. The reporting halt saved some past-due customers from the consequences of late payments but customers applying for other types of loans were left in limbo. The company quickly resolved several problems including customers who were overcharged or undercharged, but the effort was further complicated by intermittent phone outages. "Frankly, we didn't have the capacity to grow to the size we expect to grow to in the coming years," Bob Beatty, executive vice president of customer experience, told Automotive News in January. General Motors has a long and recently complex history with auto financing. 1919: GM creates General Motors Acceptance Corp. It becomes the model for modern captive finance companies. Ford follows 40 years later with Ford Motor Credit Co.
1980s-90s: GMAC expands into mortgages and corporate finance. 2006: GM sells a majority stake in GMAC to raise cash. 2009: GM further reduces its stake in GMAC, as both companies receive government bailouts. 2010: GM purchases subprime lender AmeriCredit and turns it into GM Financial; GMAC is renamed Ally Financial. 2013: GM sells its remaining ownership in Ally, and buys many of its international operations. 2014: Ally goes public at IPO price of $25 a share. 2018: GM Financial pays first dividend of $375 million to GM. Has GM learned nothing from their recent near death experience? My mindset of GM is stuck in the 1970s thru 1990s, when they blatantly designed cars to wear out, forcing customers back to the showroom. Toyota and Honda gave the BIG 3 a wake-up call with quality and durability. I don’t think that’s necessarily true anymore. The gen 3 and later motors are legendary in how long and how well they run. I’ve got an ‘03 I just bought from my life long friend that has 339k on it and it was still his daily driver until I bought it a month ago. I'll take a new GM or Ford from the last 20 years any day over an import. A GM pickup is a 300,000 mile truck these days. They'll make it 300k miles and more, but at what cost? Full size pickups are money pits, starting with their bloated purchase price and continuing with every tire replacement and gas fill-up. My friend is a big nuts for Ames Construction. They buy 3/4 Chevy's with 6.0 gas burners. He said the cost per mile is lower than anything else. They keep them for 250,000 to 300,000 miles then auction them off. They still bring anywhere from $2000-$5000 with those miles. They tried diesels but the cpm was to high. We've all known people who are driving 20 to 30 year-old Toyota pickups, or Honda cars, and they still look great. You just don't see that many old GM vehicles, and if you do they're beat up. The interior materials used by GM right up to the present day, and both Car & Driver and Motor Trend often comment on this, are cheap when compared to the competition. I gave up on diesel pick ups for this very reason. The 6.0 chevys just run and run. I’m currently running an 03’ 2500 2wd regular cab and I love it. Send a 100 HP tractor to do a job that wouldn't even challenge a 20 HP tractor and it'll tend to use fuel like a 100 HP tractor. That's 'cause a lot of the fuel a tractor uses is just to pull it's weight around, never mind do any work. My tractor is rated for 10 KW at the PTO, and I rarely use those 10 KW. You could double that 10 KW I'm not even using all of and the driveway won't get plowed any faster, if I want to plow the driveway faster it'd make more sense to get a wider bucket or better yet a plow instead of more HP. Same with cars and trucks- If you really need the ability to haul a ton, get a 3/4 or 1 ton pickup or better yet a flatbed. If not, you're just burning gas and $$$ to drag around a lot of dead weight and wind resistance. When the pickup box rusts out, I will diffently be looking at a flatbed for the Power Chevy. That’s what my kids call my work truck. PHOENIX — When you make big investments in a pickup to improve fuel economy — think Ford's aluminum-body F-150 or the mild-hybrid system on Ram's 1500 — you expect significant results. So how does General Motors explain shifting to a four-cylinder turbo for its redesigned full-size pickups and getting little gain in combined EPA fuel economy ratings over the previous generation's V-6? 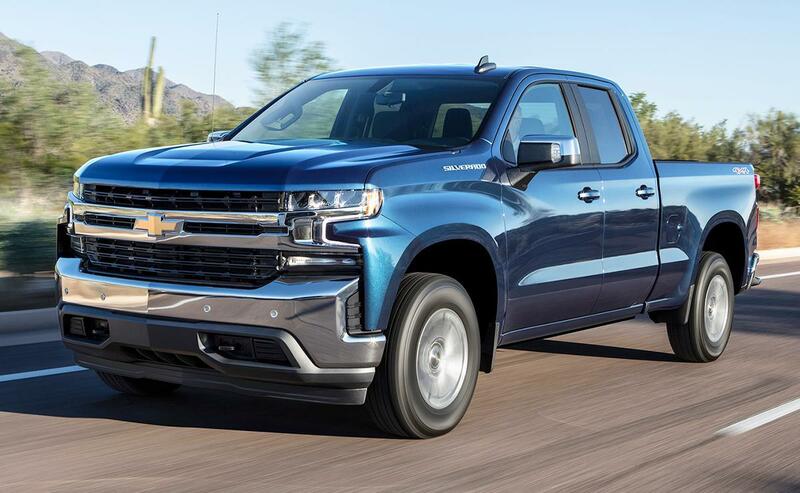 "I don't think we're done with the fuel economy piece yet," said Tim Herrick, executive chief engineer of GM's full-size trucks, during a Silverado media drive here. "We learn more and more every day." Squeezing fuel economy gains out of pickups is never easy. Ford's 2015 aluminum F-150 with a then-new 2.7-liter V-6 initially gained up to 4 mpg combined, while Fiat Chrysler Automobiles' 2019 Ram 1500 with eTorque gained up to 2 mpg overall. Those gains don't sound big, given the billions of dollars invested, but in percentage terms, they are huge, and their environmental impact — as measured by federal regulators — is magnified by the trucks' enormous sales volumes. The EPA rated GM's 2.7-liter engine at 20 mpg city/23 highway/21 combined. While the city rating is up 13 percent, the combined rating is just 1 mpg more than for the 4.3-liter V-6 that the four-cylinder replaces as the standard volume engine. The 4x4 models get 1 mpg less. 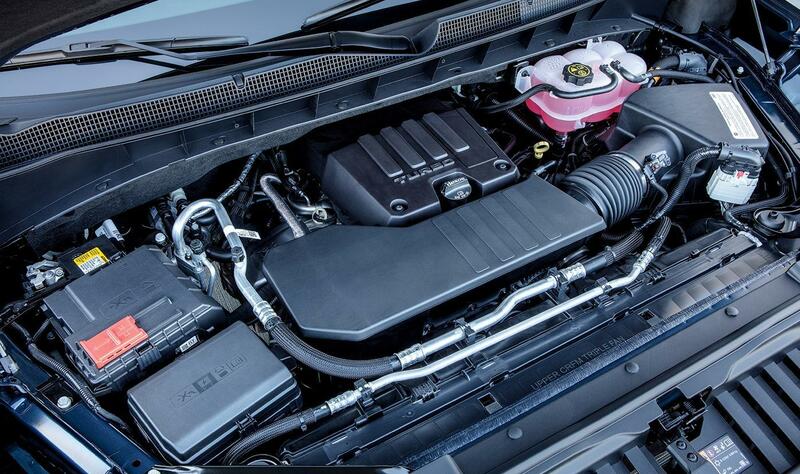 That puts GM's four-cylinder in line with comparable truck engines from Ford (3.3-liter V-6) and FCA (3.6-liter V-6 with a light hybrid system) that are rated at 22 mpg combined. Ford's 2.7-liter V-6 is rated at 22 combined mpg. "If you're delivering on everything, and you're getting the same fuel economy, the question is, 'Why?' " said Stephanie Brinley, principal automotive analyst at IHS Markit. GM officials argue the EPA ratings don't tell the whole story. As with diesel engines, they say, fuel economy will be better in the real world than its predecessor and will at least match comparable V-6 models from competitors. "Don't look at the label," said Herrick. "We're as good or better than them in every step." GM said the four-cylinder engine still delivers in other ways. It's rated at 310 hp and 348 pound-feet of torque, vs. 285 hp and 305 pound-feet of torque for the 4.3-liter V-6. It's paired with an eight-speed transmission and will be standard on the new Silverado RST and popular Silverado LT trims. "Whatever they've done to create this engine now, they'll be able to improve it going forward," said Brinley, adding that automakers routinely improve fuel efficiency on new engines. GM said the new engine package goes from 0 to 60 mph in less than 7 seconds and weighs 380 pounds less than the previous model. GM also made changes to reduce turbo lag. "We wanted it to exceed our customers' expectations, all while delivering requirements that the government has set," said Kevin Luchansky, engine architect and assistant chief engineer of the 2.7-liter turbo. "The fact that it doesn't have two more cylinders on it doesn't hurt our customers at all." Getting the engine from lines on paper to production in four years didn't come without challenges. An early iteration of the engine would hit GM's desired targets only if it ran on racing fuel, Luchansky said. "You can't sell a pickup truck and need it to run on race gas," he said. "So we had a lot of work to do." Some of that work included contracting a third party — a common practice — to help with combustion development to deliver low-end torque comparable to a diesel. The focus on low-end torque was crucial, Luchansky said, because it provides better acceleration where drivers spend most of their time and helps with fuel economy in those settings. Chevrolet expects about 10 percent of Silverado sales to be the 2.7-liter engine, said Sandor Piszar, Chevrolet truck marketing director. Brinley said that despite the EPA's fuel economy numbers, if the four-cylinder trucks indeed perform better in real-world driving, that's "more important" to consumers than a number on the sticker. Holy crap...... where's the motor?? ?